These 1.25" Agena enhanced wide angle eyepieces are sure to provide many “ooohs,” “ahhhs,” and “wows” from those who take advantage of their generous 66-deg field of view. With features generally found in more expensive eyepieces, these oculars will escalate the joys of viewing with high-contrast views and amazing color correction. 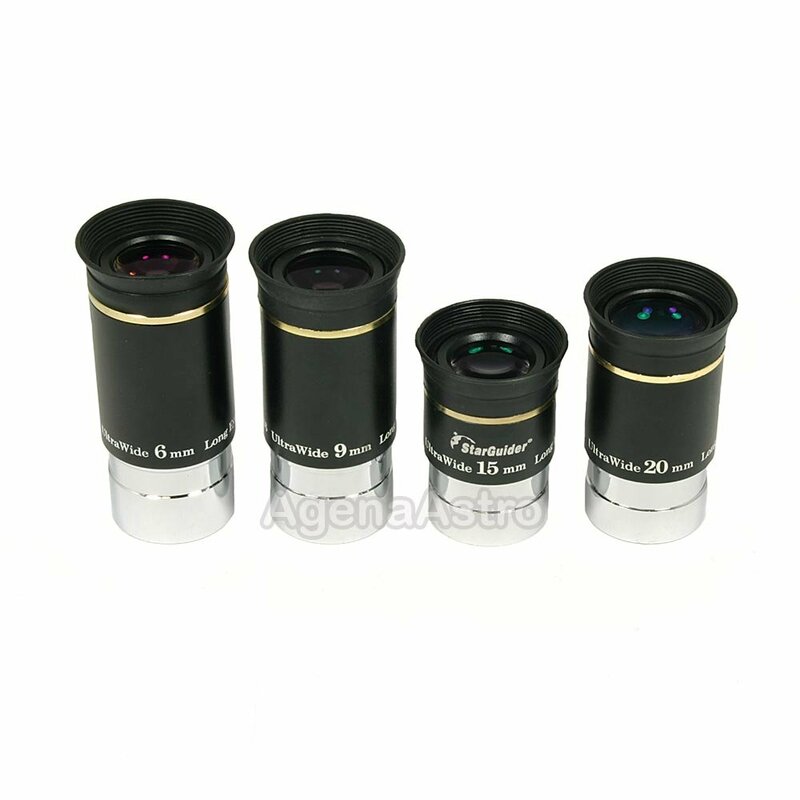 These high quality eyepiece feature 4 to 6 element designs that offers superior sharpness. All air to glass surfaces have a multi-layer coating (so these are fully multi-coated, even though the barrel imprint may say "multi coated") for maximum light transmission. The long eye relief allows for a comfortable viewing distance. All lens edges are blackened for superior contrast. The insert tubes are smooth-sided and threaded for standard 1.25" astronomy filters. Order a set today to start enjoying wide and comfortable moderate to high power views of Saturn’s Rings, Jupiter’s Bands, icecaps on Mars, and more! The generous field of view of these eyepieces also allows for wide views of the Moon and deep-sky objects at moderate to high magnification. 4.8 (Based on 6 Reviews) 67% of reviewers recommended this product. Review by Zhimbo of Ann Arbor, MI. A really great value - a terrific starter wide-field set, or as a secondary set for travel/outreach if you don't want to lug your big ol' expensive eyepieces around. The shorter focal lengths are the real stars; the longer focal lengths are more prone to astigmatism in shorter f-ratio telescopes. Review by haker of Sugar Grove, NC. These are fantastic in my son's f/5.9 XT8 and I recommend them for that type of dob. I was impressed with the views in that scope with the set we received. However, they are unsatisfactory in my f/4.7 XT12 and so I would not recommend them for larger/faster dobs, but a great overall value for slower dobs. Review by mwc of Las Vegas. This is great budget upgrade from the included eyepieces w/ most scopes. Pretty good eye relief, and nice quality views. 6mm/9mm are great performers, faster scopes may have some distortion at the edges on the 15mm/20mm. Still plenty of fine FOV in middle, and if you're dwelling on edge distortion, then shame on you for missing the point of budget eyepieces! Review by ptrp007 of Bakersfield California. Review by gherling of Piedecuesta, Santander, Colombia. 5.0 Excellent product. Very satisfied. Excellent product. Very satisfied by the quality and price.